The Balvenie DoubleWood is a 12 year old single malt which gains its distinctive character from being matured in two wood types. Over the period of maturation it is transferred from a traditional oak whisky cask to a first fill European oak sherry cask. Nose - Sweet fruit and Oloroso sherry notes, layered with honey and vanilla. Taste -Smooth and mellow with beautifully combined flavours ~ nutty sweetness, cinnamon spiciness and a delicately proportioned layer of sherry. To craft DoubleWood 17 Year Old Malt Master David Stewart, who celebrated his 50th year at The Balvenie in 2012, returned to one of his most celebrated achievements – consecutive maturation in two different types of cask, a process often referred to as ‘cask finishing’. This technique is at the heart of The Balvenie DoubleWood – it sees the whisky matured first in American oak barrels, which impart soft sweet vanilla notes, before being transferred to European oak sherry casks, where the second cask ageing adds rich spicy flavours and a depth and fullness of flavour. Nose -Elegant and complex oak, vanilla, honeyed sweetness and a hint of green apple. Taste -Sweet with dried fruits, sherbet spice, toasted almonds and cinnamon, layered with a richness of creamy toffee notes and traces of oak and deep vanilla. Finish -Vanilla oak, honey and spicy sweetness. Taste - Refined with remarkable character, it is creamy and silky with fruit, honey and spice notes. On 28th May 1963, one year after our Malt Master David Stewart joined the distillery, we filled two European oak hogsheads (Cask 4567 and 4570) with Balvenie new make spirit. Fifty years on, the whisky in Cask 4567 has matured into a beautiful single malt with a deep reddish hue and exceptionally full taste, characterised by dark fruits and spice. It’s a wonderfully complex and elegant single malt; a perfect example of Balvenie aged for many years in European oak. ABV of 45.4%. Limited edition release with only 131 bottles. Nose - Rich and deep, initial oakiness is followed by sweeter aromas of raisins and sultanas and a subtle ginger spiciness.. Taste - Lush with rich dark fruits, including cherries and blackberries and a spicy outburst of ground ginger, cinnamon and allspice. Oak tannin and a delicious sweetness develop. Finish- Rich and spicy with dried fruits and a lingering sweetness. 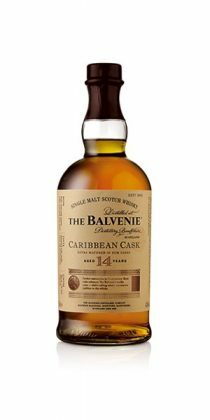 Caribbean Cask has been matured in traditional oak whisky casks for 14 years, and then ‘finished’ in casks that previously held Caribbean rum.